Members of the Sheheen family unveil the sign for the new land. Lancaster & Kershaw Counties, S.C. (August 5, 2016) – Today South Carolina Senators Vincent Sheheen and Greg Gregory, the South Carolina Department of Natural Resources (DNR) and The Conservation Fund joined other state and local officials, community members and private partners to celebrate the completion of an extraordinary effort to conserve more than 14 miles of Lake Wateree shoreline. At an event today at the recently-established Liberty Hill Wildlife Management Area (WMA), more than 3,400 acres were dedicated as the Austin Sheheen Sr. Natural Resources Area in memory of the former Kershaw County Chamber of Commerce president and dedicated public servant. Mr. Sheheen not only dedicated his life to public service but also established a legacy for his children and grandchildren, who have so passionately followed in his footsteps. 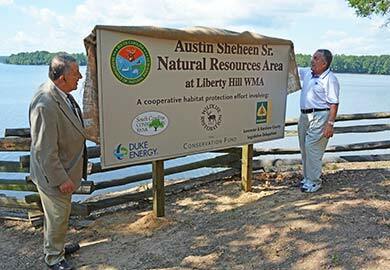 Located across the lake from Lake Wateree State Park, the new Austin Sheheen Sr. Natural Resources Area will be managed by the DNR as part of the Liberty Hill WMA for wildlife habitat and water quality preservation and will be open for public recreation, including hiking, hunting, bird watching and fishing. Its protection was made possible with funding from the South Carolina Conservation Bank, the South Carolina Heritage Trust Fund, the U.S. Forest Service’s Forest Legacy Program through the Land and Water Conservation Fund (LWCF), Duke Energy, the U.S. Fish and Wildlife Service’s Pittman-Robertson Wildlife Restoration Program, the South Carolina Department of Natural Resources, Kershaw County and Lancaster County Water Recreation Trust Funds. "DNR is extremely excited to continue our 75-year tradition of providing public lands to South Carolinians through the acquisition of this 3,400-acre parcel," said DNR Director Alvin Taylor. 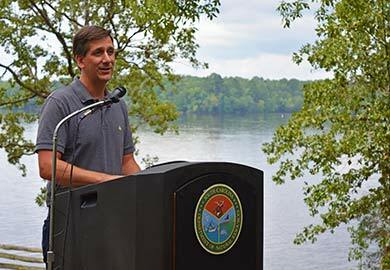 "It will provide a wealth of hunting and fishing opportunities as well as protect the beautiful viewshed of Lake Wateree, and we are truly grateful for our dedicated conservation partners for helping us to achieve this conservation success." "We are keeping safe a precious gift from God," said Senator Sheheen. "One hundred years from now, the children and grandchildren of South Carolina will stand on the banks of Lake Wateree and say, '‘job well done.'" Formerly known as Liberty Hill Farms, the property was the largest undeveloped tract of land along Lake Wateree. The Conservation Fund, a national non-profit organization, in partnership with the DNR purchased the entire property in 2013, protecting it from plans for residential development. The Fund transferred the property in two phases, with the final transfer of 1,824 acres to the DNR in July. "Five years ago, this entire stretch of land was zoned, staked and ready to be sold, divided and developed for only few to enjoy. 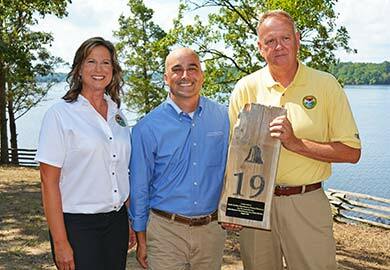 Today, thanks to the support of numerous private and public partners, everyone can visit the Austin Sheheen Sr. Natural Resources Area and delight in the natural tranquility and recreational opportunities found on the shores of Lake Wateree," said Jason Johnson, South Carolina Director of The Conservation Fund. "We're grateful to all of our partners for their cooperation and to the South Carolina congressional delegation for their support of the Land and Water Conservation Fund, which gives us the opportunity to protect important places like these before they are lost forever." LWCF is a bipartisan, federal program that uses a percentage of proceeds from offshore oil and gas royalties—not taxpayer dollars. LWCF and the Forest Legacy Program are annually funded by the U.S. Congress, including South Carolina’s U.S. delegation representing Lancaster & Kershaw Counties: U.S. Senator Lindsey Graham, U.S. Senator Tim Scott and U.S. Representative Mick Mulvaney. "I am proud to support the Land and Water Conservation Fund as an important tool in protecting South Carolina’s natural resources," said Senator Graham. "The creation of the Liberty Hill Wildlife Management Area and the Austin Sheheen Sr. Natural Resources Area is a great example of the value of LWCF. Through LWCF and other partners, these 14 miles of the Lake Wateree shoreline will be preserved so future generations can enjoy South Carolina’s great outdoors." The forested property features mixed pine-hardwood slopes, loblolly pine ridgetops and open meadows that provide habitat for numerous wildlife species, including white-tailed deer, turkey, bobwhite quail and songbirds. Also found on the tract are hundred-year-old longleaf pines, as well as unique granite boulders that dot the landscape, giving the region the nickname, "the Devil’s Backbone." "The uniqueness and diversity of the rolling ridges and the location on the waters of Lake Wateree make Liberty Hill a singularly incredible place for South Carolinians and visitors to come and enjoy the natural beauty of our state," said Marvin N. Davant, Executive Director of the S.C. Conservation Bank. "The Conservation Bank is pleased to partner with The Conservation Fund and the Department of Natural Resources to make this dedication possible. Liberty Hill will be a tremendous asset for all and will add much to the local economy of the area; but most importantly it will serve to create many fond memories for many families for generations to come." "For many years, Liberty Hill has been a coveted resource for its species protection, habitat conservation and public recreation attributes as well as for its development potential," said Clark Gillespy, Duke Energy's state president for South Carolina. Thanks to the innovative leadership of DNR and all of the organizations involved in this effort, this land will be preserved for the protection of South Carolina’s natural resources and for the enjoyment of its citizens for years to come." Under active timber management since 1959 and wildlife management since 1982, the tract will continue to be a working forest. Future timber management activities will entail selective thinning and prescribed fire to enhance plant and animal habitat, and the reintroduction of longleaf and shortleaf pine. "The Forest Legacy program promotes the long-term integrity of working forestlands," said Tony Tooke, Regional Forester for the U.S. Forest Service's Southern Region. "By protecting water quality and wildlife habitat, the Liberty Hill Wildlife Management Area can be enjoyed for generations to come rather than simply becoming another forested area lost to development." To visit this amazing property or learn more about WMA opportunities in your area, go to https://www2.dnr.sc.gov/ManagedLands/.